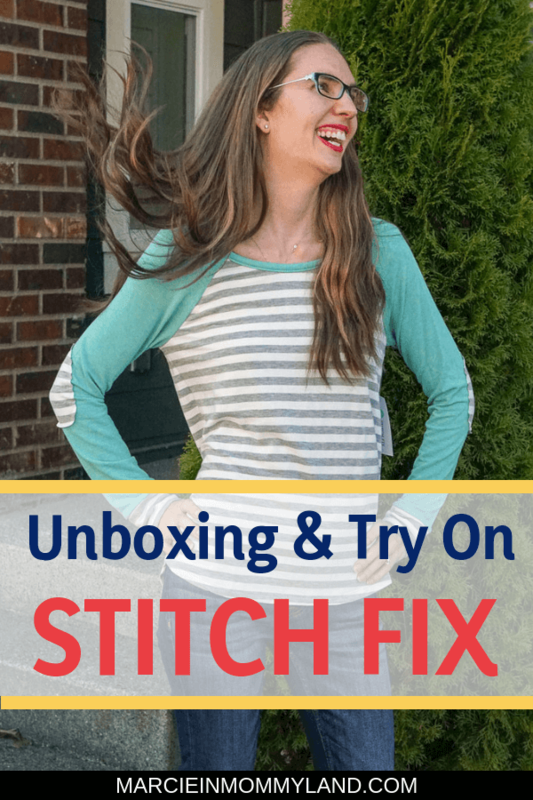 Even since I signed up for Stitch Fix, I get absolutely giddy to do a Stitch Fix unboxing video and blog post! It’s like opening up an awesome present where I know the clothes will fix and I might discover a new style I never would have picked out in a store! 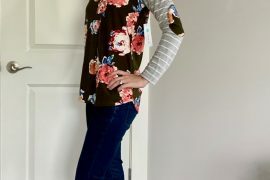 Find out what was in my last Stitch Fix box. The weather in Seattle this March has been all over the place! We had snow on our lawn for 4 weeks! I’m not joking. And it only melted because we had a slew of 70 and 80 degree days this week! Warmest winter temperatures recorded in Seattle! These crazy temperatures had me scrambling to find the right clothes to wear. Thankfully, my newest Stitch Fix subscription box came and I was excited to see what was inside! 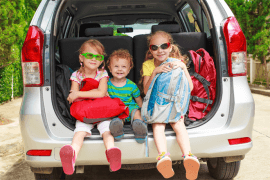 I told my stylist that I’m a family travel blogger and that I like bright clothes that photograph well and would be comfortable for some of the trips I have planned this spring. So, let’s see what was inside! I have to say, I had a mixed reaction when I opened up my newest Stitch Fix box. You know how something can technically be right, but you just don’t get all the feels for it? That’s how this box felt. Everything fit and they are probably items that I would have grabbed to try on at a store, but none of them really sparked joy for me. I’ve seen this brand a lot in stores, but I’ve never tried them on. The Erika Skinny Jean is just your basic jean that’s a staple for any wardrobe year round. These jeans fit me like a glove! I have a difficult time finding jeans that fit my hips and my waist. And I don’t want them to be too low-rise or high-rise. The waist hit at the right spot and the length was perfect! The only thing I didn’t like is that I already own 2 pairs of jeans that are the same style and fit me just as well. I don’t need a 3rd pair. I wish they were distressed or something that would have made them more interesting. Stripes are definitely the rage right now and I remember seeing this shirt pop up on my rating section and I know I clicked thumbs up on it. 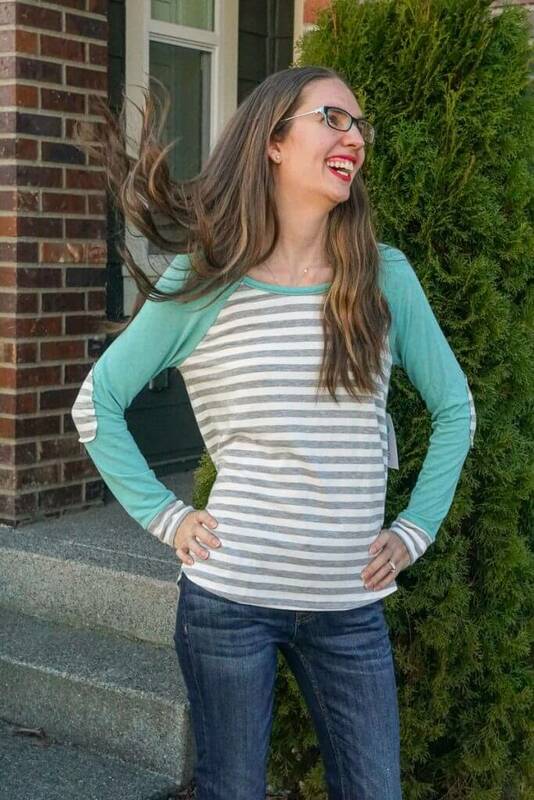 This t-shirt is incredibly soft and I love the springtime feel! And I liked that the shirt length hit my hipbones, which is where I like my shirts to fall. The shirt was kind of wide and felt a bit boxy when I tried it on. And the elbow patches made the shirt look cheap. I wish the edges didn’t flare up and that the patches were thicker material. 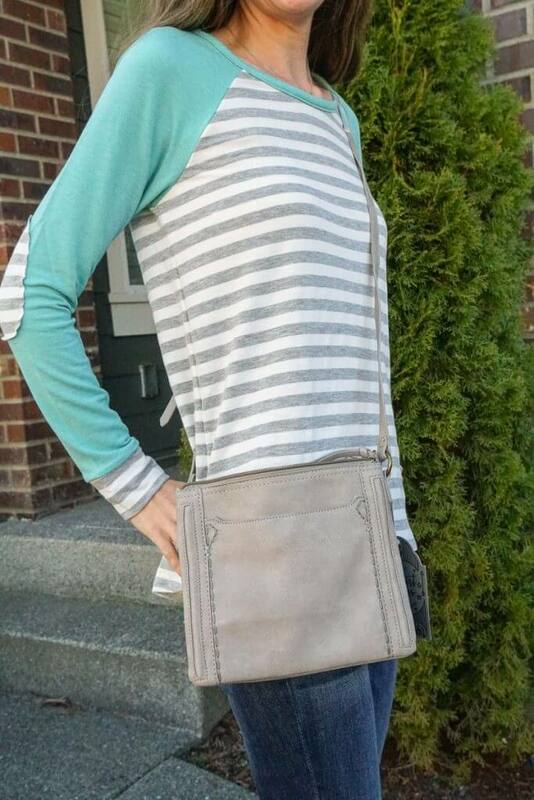 This Caren Double Zip Crossbody bag has two zippered pouches and a bit of top stitch styling on the front. It has an adjustable strap. It was an interesting size for me, as a mom with little kids. There are 2 pouches, where I could easily stash a few snacks and a diaper. And I liked the neutral color. The material felt inexpensive. And it was a bit too small to easily hold my wallet. I felt awkward wearing it. I like to invest in quality bags, so this one just didn’t make the cut for me. This is an ideal weight and color for spring and summer. 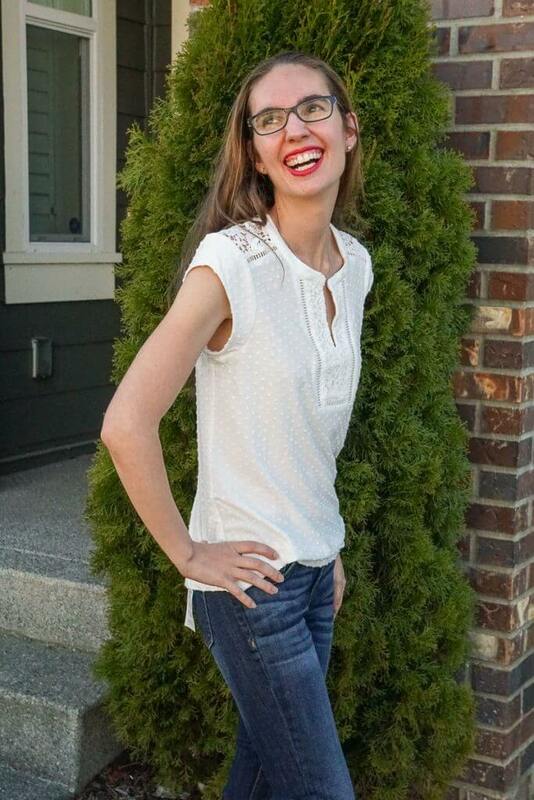 It has crocheted lace on the shoulders and across the upper back of this shirt. The rest is textured with polka dots. I love that it looks a bit feminine without going overboard. It’s a classic piece that would work for business casual or just casual. I think it looks better on a person than it does on a hangar. I hate having to stress about what bra to wear under shirts. This one has a lacy back that shows my bra straps. I don’t like showing my bra straps so I know I just wouldn’t ever wear this. And the material had embossed polka dots which felt weird when I was wearing it. I know it would bother me. 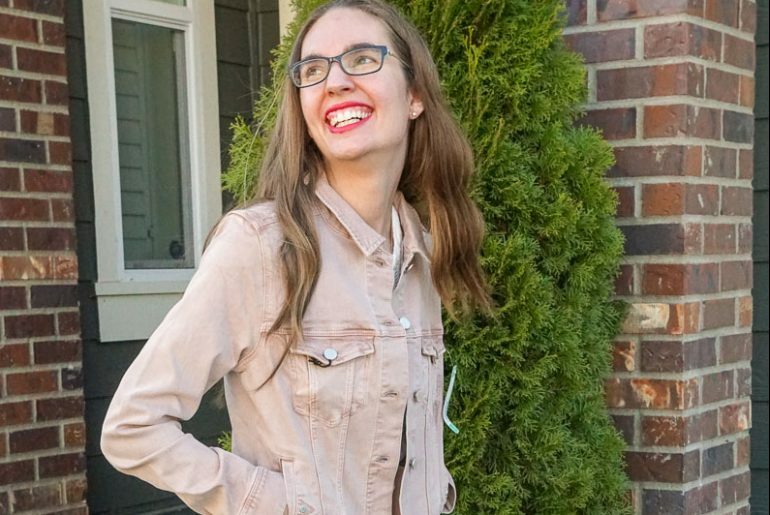 Blush is still one of the trendiest colors for spring, so this Temma Denim Jacket is an updated classic that can easily be dressed down with yoga wear or paired with a cute spring dress. The material is a little stretchy and it was super comfortable to wear. The color. I’m just as much of a blush fan as the next mom, however this shade feels a bit sad to me. And it felt super boxy. Even when I buttoned it, I just didn’t feel cute in it. 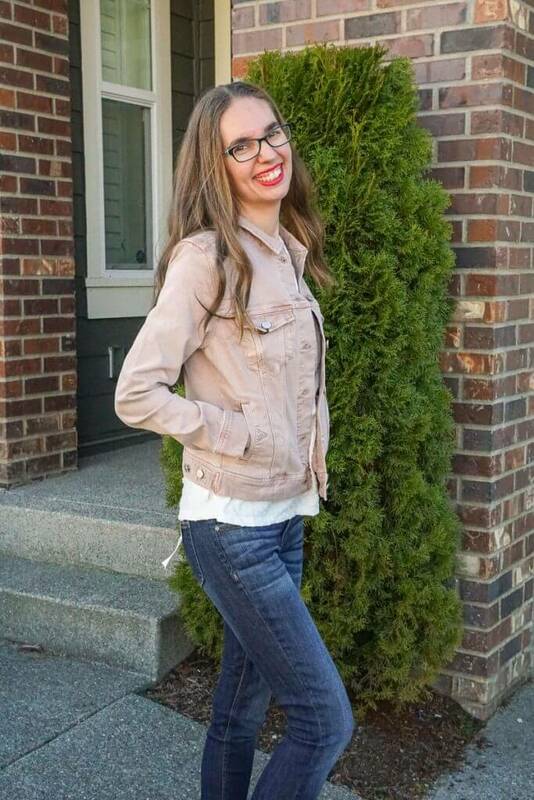 And since I already have a denim jacket that I love, this didn’t make the cut. 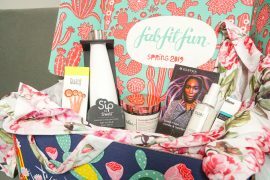 So, my March 2019 Stitch Fix subscription box was kind of a bust. I liked everything to some extent, but I wasn’t “wowed” by any of them. And I didn’t love anything so much that I had to have it. I’m going to start writing more specific notes for my stylist and I’m going to continue to rate products on their website to help narrow down the type of items I like. I’m heading to Portland, Maine in May for the Women in Travel Summit and I’m hoping to find a few items to wear as I explore the city! My next Stitch Fix box will be here in April! 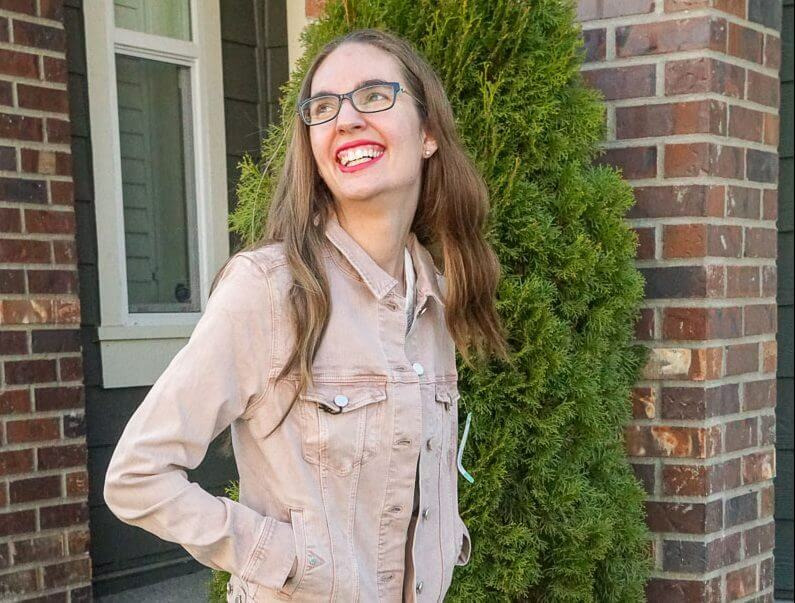 I think the concept of Stitch Fix is so interesting. They don’t ding you for returning an entire box? You pay a styling fee every month, but there are free returns. The jacket felt so soft and comfortable! I know! Great staple pieces, it’s just that I already have similar items. Yes, everything was cute, but too similar to what I already own. Sorry you didn’t find anything you didn’t want to keep. Hopefully next time will work out better! Yes, I have high hopes for next month’s box!